Solitaire is a game of patience, The multiplayer mode let's you battle other players who are given the same deck. 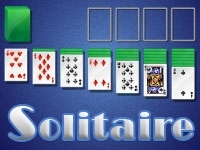 Solitaire is a traditional card game is played alone. The aim of the game is to reconstruct the four complete suits, ranking ace to king. The four empty cells (foundations) in the upper right of the screen are where you will construct the ordered suits. 28 cards are dealt in to 7 stacks, of 1,2,3,4,5,6 and 7 cards. The remainder of the cards are placed, face down at the top, left of the screen to form the 'stock'. One (easy level) or more cards are turned face up from the stock, the topmost of these is available for play. If an ace is visible (from the stock, or face up at the bottom of a column), double-click it and it will be automatically moved to form the suits foundation. In our example, we must double-click on the ace of diamonds. As cards in a foundations sequence are exposed they may be moved 'out' by double clicking them. Other cards can be *only* moved between the columns, or from the upturned stock to columns, to form runs of descending value, and alternating color. In our example, we can move the the 6 of hearts onto the 7 of clubs. When you have constructed an valid run in any column - you can move all or part of it onto any other column. If your game is deadlocked, use the cards from the stock to help you continue your runs. If you exhaust the stock, double click the symbol to start turn the stock back over and re-use it. To move a card or stack of cards from one column to another, click on it and drag. To take a card from the stock, or from a column to a suits foundation, double-click it. If a column is empty, you can place a king alone or with other cards onto it beginning a new sequence. Always return cards from the stacks before clicking on the card at the top of the stock. Balance the run lengths. Whenever possible, make sure that no run is much longer than others. Following a very long run may prevent you from making other moves. Start with the columns that contain the largest number of cards. The more cards hidden in a column, the greater the incentive to return the first card in this column.